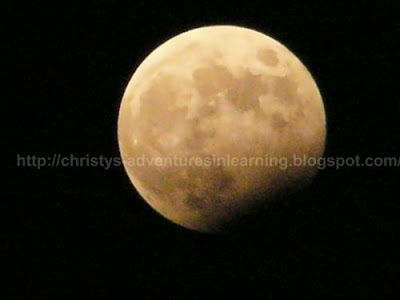 You did not miss the total lunar eclipse, it is Wednesday, Feburary 20-21 evening. But I almost missed this partial one. I was walking home from a friends and noticed the moon was eclipsing! When I arived home I set up my camera and tripod and spent almost 2 hours taking pictures of the eclipse. Wednesdays total eclipse will be worth letting the kids stay up to see if you have clear skies! We are forcast for partly cloudy with snow fluries ending my midnight. I hope to get to see it! For US viewing times and path click here. Thanks for the heads up about tomorrow night!!!! Your pictures came out incredible! And do not seek what you should eat or what you should drink, nor have an anxious mind. For all these things the nations of the world seek after, and your Father knows that you need these things. But seek the kingdom of God, and all these things shall be added to you. I am just a woman seeking to "Love the Lord my God with all my heart, all my soul and all my mind"
Thank our service men and women! It's Mine I Tell Ya, It's Mine! ::SNORT::Men & Women Are Different! Look what a difference 2 hours can make!